Summertime is all about ice cream and frozen treats – for dogs and humans alike. You can enjoy your favorite frozen snack alongside your canine friend, but you’ll first need to prepare something a bit more dog-friendly than a dish of chocolate and vanilla swirl. Making healthy, frozen dog treats is surprisingly easy to do – and, it’s cheaper than store-bought ice cream for dogs. Are you ready to make frozen yummies for your favorite canine companions? ¾ cup of strawberries (preferably organic). Frozen strawberries will work too. This recipe makes around 15 scoops, enough to serve now and freeze the rest for later. 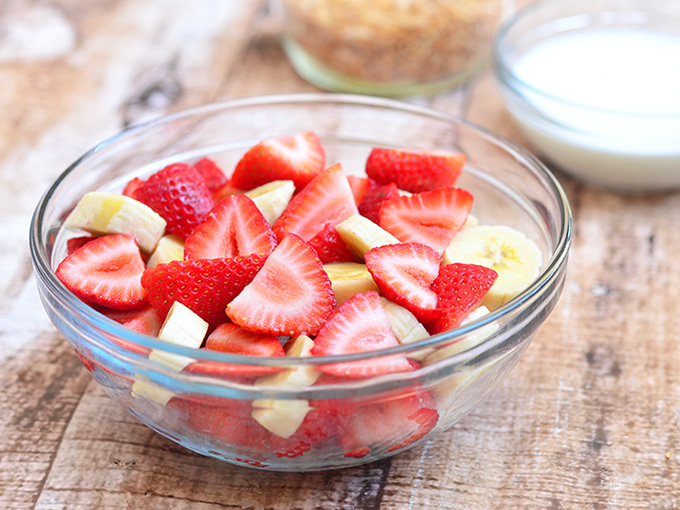 Place the strawberries and bananas in the freezer for 2 to 3 hours until frozen. Once frozen, toss the bananas and strawberries into the blender and blend the frozen fruit until smooth and creamy. Scoop the mixture out of the blender using a large spoon and place it into a bowl. If you let it sit for 40 minutes or so, it will be slightly firmer. 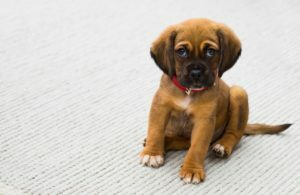 Place what you can’t use right away into the storage containers and refreeze until the next time your dog wants a treat. 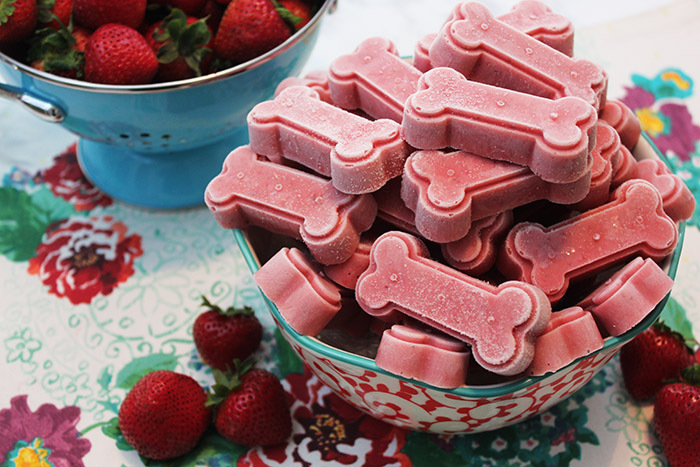 You can customize this homemade, frozen dog treat by substituting blueberries, blackberries, or raspberries for strawberries. Just be sure to keep the banana, as it makes the frozen treat creamier, a tad sweeter, and adds texture. Another tip: If your dog enjoys berries, you can always freeze them or buy pre-frozen ones and give them a few to munch on as a treat. What are the Health Benefits of Fruity, Frozen Dog Treats? If only humans ate such healthy ice cream! Notice there’s no added sugar in this recipe, so the treats won’t harm your dog’s teeth or cause weight gain. Natural ingredients, like berries and bananas, are some of the most nutrient-dense, easy-to-digest foods for dogs. Berries are a source of vitamin C, fiber, potassium, and antioxidants, while bananas are an excellent source of potassium and healthy carbohydrates for energy. Plus, the carbohydrates in bananas serve as food for gut-friendly bacteria that help keep your dog’s digestive tract healthy. Most dogs enjoy the taste of bananas, too! Just avoid giving your canine pals the peels. While this frozen treat is perfectly healthy for most dogs – we encourage you to avoid feeding your pup regular ice cream, as it contains ingredients that are dangerous to dogs. Instead, stick to the Fruity, Frozen Dog Treats, and your pup should have no issue digesting them. These dairy-free frozen treats are ideal for dogs of all sizes, and the ingredients are nutritious and easy to digest. Best of all, your dog can enjoy a summertime treat right along with you! Be sure to make extra to freeze. You’ll be glad you have some extra on hand as the temperatures climb. If your pup isn’t a fruit fan, or you want to try making another one of our homemade dog treats, take a look at the Sweet Potato Chews recipe! Those dog treats look absolutely delicious (not just for my dog!). Will definitely try them and hopefully my Happy will like them! Thanks so much for the recipe!